Magnificent as solitary specimen trees, beeches (Fagus spp.) are large deciduous plants admired for their shape and foliage. When it comes to variety, the European beech (Fagus sylvatica) comprises many forms and selections of heightened beauty and ornamental value for gardens. European beech is best grown in USDA Hardiness Zones 5 through 7. The fern-leaf beech (Fagus sylvatica cv. Aspleniifolia) has slender, glossy, deep green leaves that are cut into lobes. Thus, each leaf looks frilled, abstractly resembling a fern frond. The overall effect of the deeply lobed foliage is a tree with fine texture. Rather than hold its muscular branches horizontally and upward towards the sky, the weeping beech (Fagus sylvatica f. pendula) has branches and twigs that dangle and touch the ground. The tree looks like an irregular, large mound with twigs that move like curtains in the wind. Copper beech (Fagus sylvatica f. purpurea) is one of the visually stunning varieties of the species. 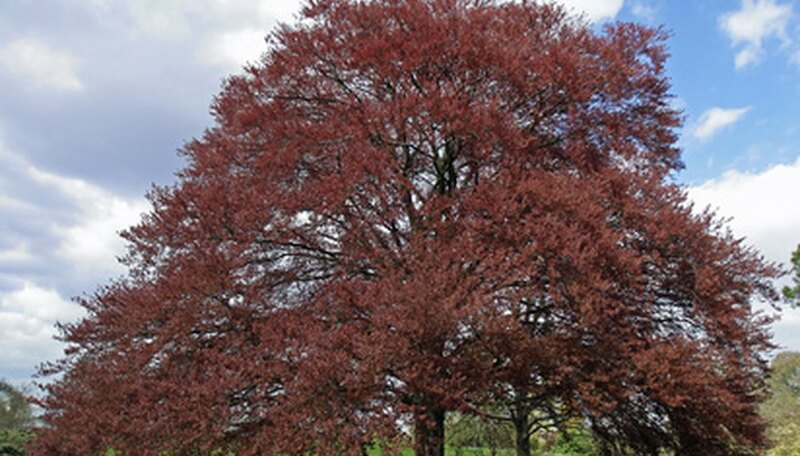 Instead of glossy green leaves, the copper beech produces flossy purple or dark burgundy foliage that attains coppery hues in autumn before dropping off. Over the centuries, horticulturalists have selected and bred various mutations of the European beech. Many of these cultivated varieties, or cultivars, have leaves with changing or multiple colors. Aurea Pendula and Dawyck Gold are narrow trees with yellow young leaves that mature green. Similar in habit but with purple leaves is cultivar Dawyck Purple. Purpurea Pendula, a dwarf cultivar, only grows 10 feet tall and wide with black-purple leaves. Purpurea Tricolor, also known as Roseomarginata or Tricolor has purple leaves edged and striped in rose and pale pink. Three additional purple-leaf cultivars include Riversii, Rohanii and Spaethiana, which has contrasting lighter colored veins. Lastly, rather than pointed oval leaves, Rotundifolia and Cochleata have round leaves that create a different texture than most other European beech trees. Although the widest array of natural and man-selected varieties are found with the European beech, other beech trees are available and grown by gardeners. Four others that are more commonly encountered include the American beech (Fagus grandifolia), the Japanese beech (Fagus crenata), Oriental beech (Fagus orientalis) and the Japanese blue beech (Fagus japonica).